Aerospace is an industry long-famed for its proclivity for innovation. From popularized achievements like the SpaceX reusable rocket to invaluable modernizations such as solar-powered aircraft, the hype over the industry's increasing rate of change has grown almost clichéd. However, seldom discussed are the challenges to project management born out of this disruption to the status quo. Here we provide a handful of the most important. Digitalization – the process of using digital technologies to change a business model and provide new revenue and value-producing opportunities – is revolutionizing industries across the world. 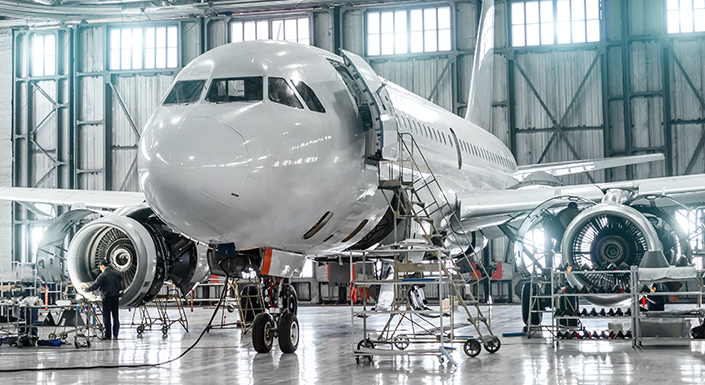 And while Aerospace is an industry renowned for its high-end engineering, some of the technologies used in manufacturing and other business processes find a place under the legacy umbrella. Upgrading all manufacturing technologies on a regular basis, and adopting new and advanced market-leading software is imperative to stay competitive with market-leaders. New initiatives such as 3D printing and modular design are but the tip of the iceberg – for companies that wish to reduce supply chain time, improve reliability and productivity, and simplify designs, a continued focus on digitalization is imperative. The relationship between Aerospace and Defense is unambiguous. In the United States, military aircraft accounted for approximately 14% of all Aerospace exports in 2018. Meanwhile, across the pond, the U.K. Government pledged £3.9 billion to the Aerospace sector for military-driven development projects. This heavy reliance on military spending has its drawbacks, however, and any uncertainty surrounding Defense budget cuts – often characterized by socio-economic and political uncertainty – is oft met with justified trepidation from the industry. With less capital, it's likely you'll struggle to attain the resources, workforce, and skills required to complete projects on time and on budget. And for projects mid-construction, the risk of non-completion increases greatly. A highly engaged, talented workforce can help Aerospace organizations to gain a competitive advantage in the marketplace. But as the boomer generation settles into retirement and Generation X drift towards the end of their careers, talented Aerospace project managers have become a rare and lucrative commodity. Demand for qualified Aerospace project managers now outweighs supply and, if current projections are to be believed – it’s set to get much worse. According to a study from The Project Management Institute, by 2027, employers will need 87.7 million individuals working in project management-oriented roles. Meanwhile, the talent gap could result in a potential loss of some US$207.9 billion in GDP. And it’s not only attracting qualified Aerospace project managers that's a problem, retaining their services while competitors try to offer packages to tempt them away is also a very real possibility for Aerospace organizations. Globalization – the increasing integration of world markets – has done a lot of good things for the Aerospace industry. It’s helped break down the barriers of stifling country-specific regulations, improved supply chains across the globe, and grown the industry into a vibrant and profitable arena. However, globalization has had its drawbacks as well. For Aerospace organizations with a global footprint, the competition in the market is greater than ever, and the health of the world economy now has a direct impact on the profitability and success of their projects. In regard to project management, if an economic depression occurs in one country, it can trigger adverse reactions across the globe. Supply chain routes can be compromised, resources can fluctuate in demand, and workforce costs can increase severely. As the world economy is balanced on a knife-edge, even the slightest disruption could have significant ramifications to any Aerospace project. As discussed, the Aerospace industry is strongly linked with Defense. Therefore, there's always been a keen focus on promoting security policies. Cyber security has quickly grown to become one of the greatest threats to business, and, for Aerospace organizations, is now of the utmost importance. From phishing attacks that try to obtain logins and passwords, to malware that can steal and corrupt valuable data, cyber attacks come in many forms and can have a disastrous impact on the success of any project. With the possibility of corrupted data, the discovery of a cyber-attack can cause significant delays to project management as even the slightest discrepancy could cause catastrophic consequences. The challenges present within Aerospace project management present a serious threat to the success of projects across the globe. Socio-political disruption coupled with emerging technology trends have ensured that the risk vectors for the Aerospace industry remain vast and various. However, with the right tools, and expert insight, these risks can be measured, accounted for, and understood, so effective project management can continue unabated and project success can be achieved, both in terms of timeliness and budget. If you’d like to learn more about how conducting in-depth cost and schedule risk analysis can help mitigate cost and schedule overruns and improve project success, download our guide to cost and schedule risk analysis today.